Sometimes we are so inspired by our customers! 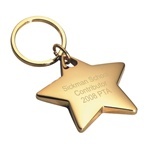 We just engraved nine Gold Star Keychains for some folks who completed Felony Drug Court. Their counselors are kind enough to present them with a symbol of their accomplishments. That gold star in their pocket will be such a nice reminder of a job well done and a fresh start, and hopefully an reminder to continue on the right path.